Former top class performer Obrigado Mais bounced back to form at the right time with a thrilling dead heat alongside Macau’s top sprinter Mister Kaopu at Taipa on Saturday. Ridden by Filipino jockey Breinell Yamzon, Obrigado Mais burst out of the pack and put in giant strides late to hit the line together with Mister Kaopu in the Class 1 over 6 f.
The judge couldn’t separate them declaring a dead heat with Bow Noculars a length back in third. Obrigado Mais was one the stars of last season winning the Winter Trophy (1800m) and Spring Trophy over 1500 metres, both Group 2 contests. 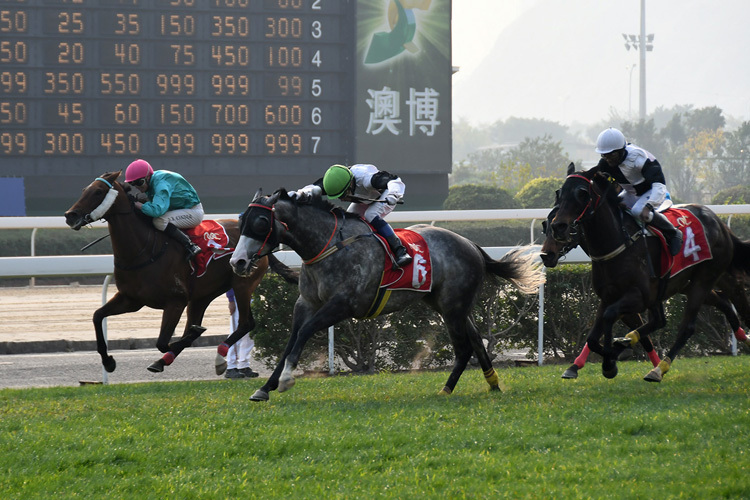 However the grey had lost all form this season and his three runs before Saturday appeared to signal that his better days were over before his form reversal. The name Obrigado Mais translates to “thank you more” in Portuguese and owner Tam Vai Lam has plenty to thank the gelding for, with nine victories and five placings from his 27 starts to date in Macau and over $HK2.8 million prize money. The six year formerly raced in Australia as Boganaire when prepared by Robert Smerdon, winning a maiden on the all weather at Geelong from only three runs in Victoria. Trainer Victor Chan will now aim the grey at next month’s G2 Spring Trophy over 7 1⁄2 f in an effort to make it back to back wins. The Sio Cheong-trained Mister Kaopu has been another great buy out of Australia. After Saturday his record stands at eight wins and four placings from his 24 Macau starts, and over $HK2.2 million in prize money. The son of Redoute’s Choice raced in Australia as Intrusion and won a Newcastle maiden from his 11 runs there under Gerald Ryan. After Saturday he is now Macau’s highest rated sprinter on 120 points. Éclair Lightning is another Australia import that is assured of a nice future after a superb win in the Class 2 & 3 over 7 1⁄2 f Saturday. The four year old son of Darci Brahma parked off the pacemaker One More Again until heads were turned for home before finding plenty under Japanese rider Shogo Nakano to hold off Luen On Eagle with One More Again staying on for third. Prepared in Macau by Peter Leyshan, Éclair Lightning is a former South Australia galloper who raced there under the same name when trained by Phillip Stokes, winning a maiden race at Gawler over 1215 metres. The gelding has furnished into an impressive individual going to scale at over 1250 pounds. The gelding is out of the NZ G2 winning mare Spin ‘N Grin who was placed up to 1 1⁄4 m so Éclair Lightning will no doubt get a good 7 1⁄2 f and could be a possible Derby contender on the strength of Saturday’s victory. Sent out friendless at odds of $334 for the win, Hey Hey Companion burst through along the inside to score from the fast finishing River Double with Broadus running in third. Pescuiso’s first winner for the season was the Stanley Chin trained God Get People at odds of $590 for the win also on the all weather surface. The good fortune didn’t end there for Pescuiso with Pearl Win Win at odds of $98 saluting under a perfect ride from the Filipino born horseman in Saturday’s Class 4 over 1500 metres. After Saturday Pescuiso has five winners from the season from only 33 rides giving him the equal third best win strike in the enclave at 15%.